The future outlook of the product tanker market will be determined by the upcoming 2020 sulphur cap, as per the IMO guidelines. 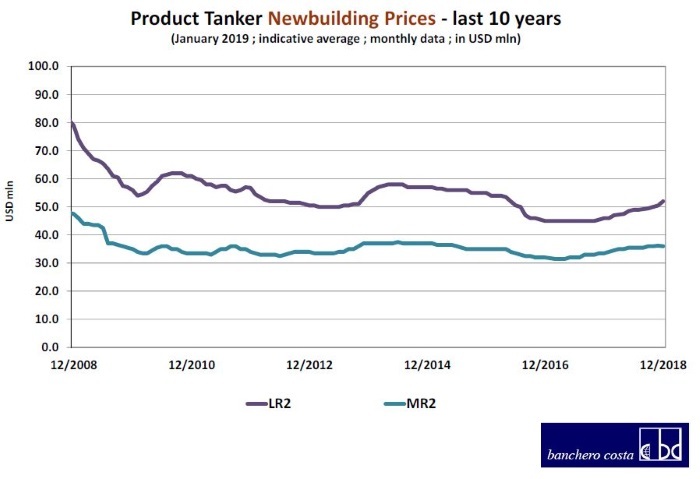 In a recent report, shipbroker Banchero Costa said that “the product tanker sector recorded a terrible 2017 and also most of 2018 maintained the same trend, except for newbuilding and secondhand prices that turned around. 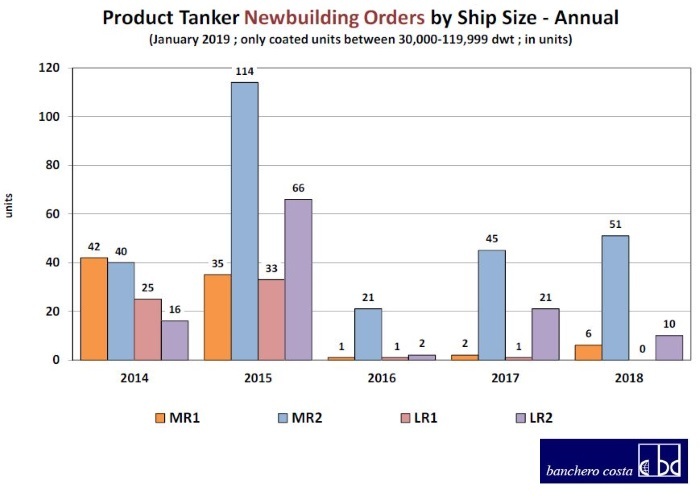 The persistence of a low market was mostly caused by the large numbers of new vessels still delivered in 2017, around 138 units, that worsened a market that already was oversupplied. 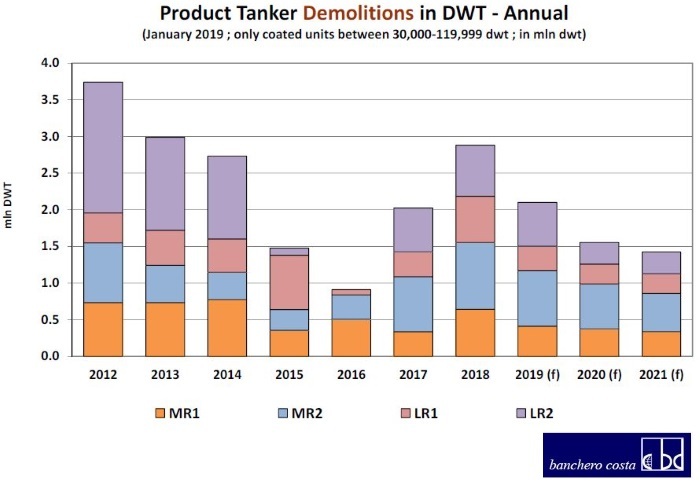 However, the demolition activity proved remarkably strong, reaching a total of 2.88 million dwt scrapped, +42 percent compared to 2017”, said the shipbroker. According to Banchero Costa, “all the sectors suffered a painful year until the winter season, when the chartering market saw a sharp recovery, thanks also to the shortening of available tonnage and the fall of crude oil prices. LR2s on the MEG/Japan route averaged $7,160/d in the first 10 months of 2018 before peaking at $30,500/d in December. The earnings for MRs on the South Korea/Singapore route averaged $3,800/d from January to October 2018 and then closed the year at $19,280/d level. The MR Atlantic triangulation averaged $7,879/d for the first three quarters of 2018 whilst 17,280 $/d in the last one. 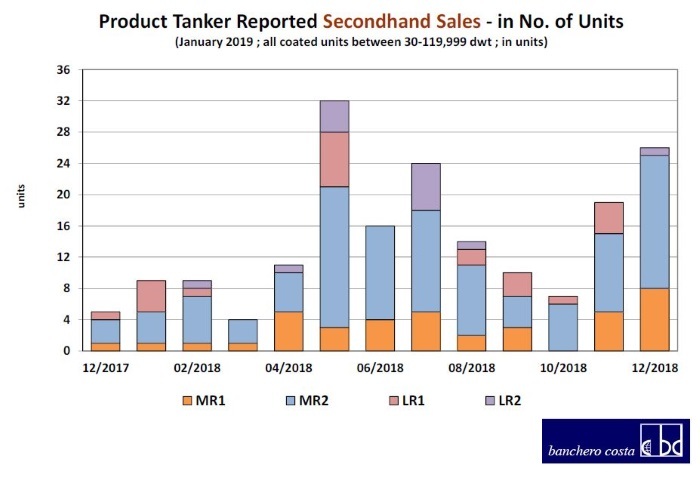 On the supply side, the total product tanker fleet grew by 2 percent in 2018, fleet growth is slowing, but especially in the LR2s segment, is still excessive”. The shipbroker added that “expectations for 2019 are for an overall growth of around 3.3 percent. In 2018 we recorded 67 new orders reported, similar to the 69 orders completed in 2017. In terms of deliveries, 98 units (6.2 million dwt) were delivered in 2018, a 32 percent increase compared to 2017. As said, the demolition activity reached a record high of 53 units in 2018, compared to 36 in 2017 and only 21 in 2016. According to the IEA, in 2019 new refining capacity is set to reach 2.6 million bpd and the demand for oil products is expected to grow by 1.1 million bpd. 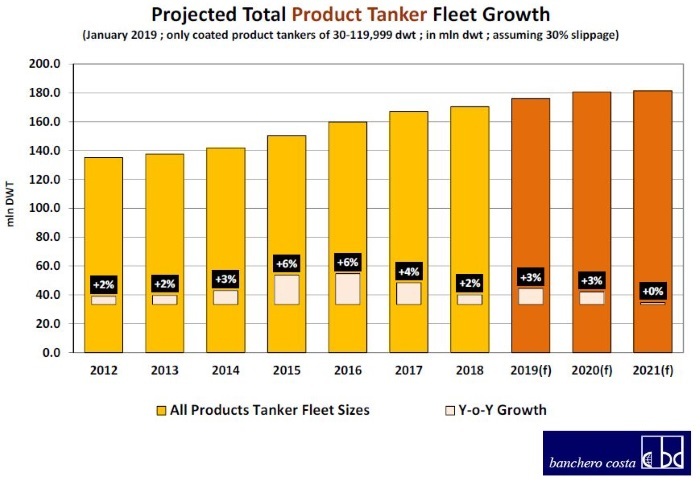 The outlook of product tankers in 2019 will be heavily affected by the looming 2020 Sulphur Cap, which we expect to offer good support to the demand of oil products tankers in the final two quarters of the year, with an increase in long haul shipment of compliant clean fuels to bunkering centers”, Banchero Costa concluded. Meanwhile, in a recent market commentary on the product tanker market, ship owner Capital Product Partners, noted that “the product tanker market registered a robust recovery in the fourth quarter of 2018, partially reversing the downward trend observed in the first nine months of the year. The beginning of the quarter was weak in line with the previous quarters, as rates hovered close to historically low levels, but the market gained momentum from early November onwards. In the West, the product tanker market experienced strong gains as earnings for MR product tankers on the benchmark transatlantic trade and from the U.S. Gulf reached three-year highs. The increase in rates was partly attributable to a surge in crude tanker rates, which has had a positive knock-on effect on product tankers, with a high number of LR2 vessels shifting from clean trade to dirty products or crude and therefore, reducing tonnage availability in the product tanker market. In addition, the stronger crude market significantly reduced cargo poaching by newbuilding crude tankers on clean routes. Aside from the positive spillover effects from the crude market, the product tanker market was bolstered by seasonally stronger demand due to increased heating oil consumption, while adverse weather conditions reduced tonnage availability. 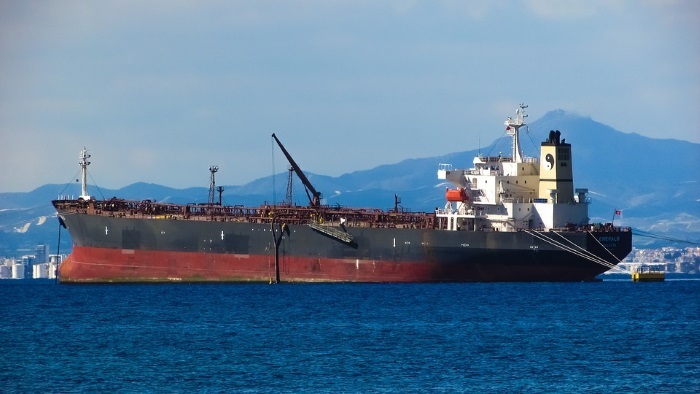 Furthermore, refinery outages in Brazil and Mexico required substantial volumes to be moved with product tankers to meet demand, which contributed to the positive trend”, said the Marinakis’-controlled partnership. According to the shipowner, “on the supply side, the orderbook remained close to historically low levels. 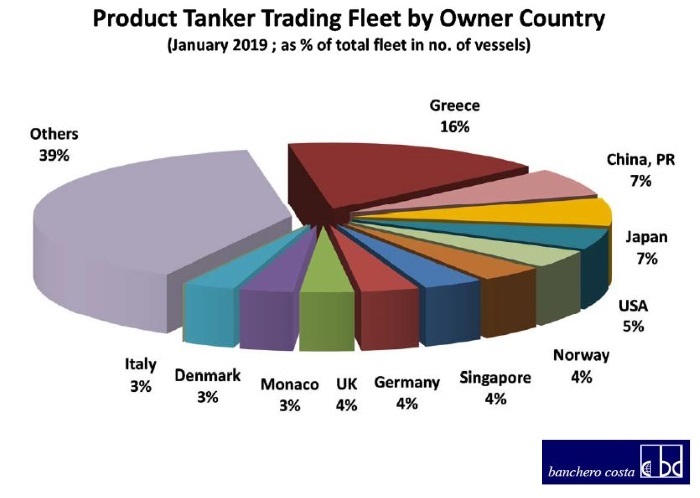 As at the end of the fourth quarter of 2018, the MR product tanker orderbook was estimated by analysts to stand at approximately 7.8% of the current worldwide fleet. 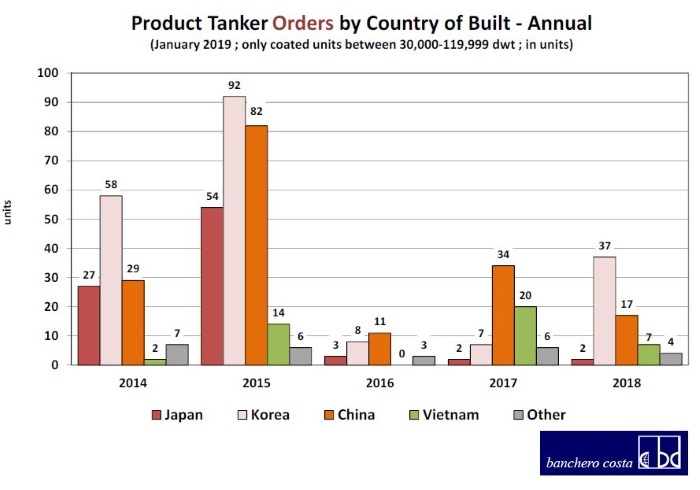 In addition, product tanker deliveries continued to experience significant slippage during 2018, as 33.8% of the expected MR and handy size tanker newbuildings were not delivered on schedule. Looking ahead, analysts estimate that product tanker deadweight demand growth will increase to 3.2% in 2019 from 2.3% in 2018, boosted by refinery capacity additions and on the back of potential positive impact from the IMO 2020 sulfur regulation. The product tanker fleet is projected by analysts to expand by 2.6% in 2019”, Capital Product Partners concluded. Previous: Fall in the BDI- is this more than a seasonal lull? Should we fear for a bad year?